Snapping that perfect photo shouldn’t be worth slipping a disk over. Remember your shot of the fresco on the ceiling of the Sistine Chapel? You were turning over 180° like an acrobat; or that time you tried to capture the breadth of the Grand Canyon and you had to hold your balance on one leg in the midst of the crowd! Were those shooting experiences worth the strain? Or was it "no pain, no gain" like everything else? Now the all-new OPPO N3 is here to give you the remedy, before you go and take a tumble for a simple photo. Among OPPO’s product lines, the N series has been designed to offer users a creative and extraordinary photography experience. The 16 megapixel swivel camera blends practicality and inventiveness and allows for seamless rotation either manually or remotely to ultimately make taking pictures more fun and dynamic. Building upon the success of the OPPO N1 and its rotating camera, the N3 takes a step further to bring more unique photography possibilities to the table. Practically all N3 users who have had firsthand experience with it cannot help but say, "this phone is really fun!" First, the novel camera rotating feature stands out where mass-market, large-screen smartphones chose to be equal. Simply activate the camera and the camera will automatically rotate when you swipe and hold on the display. However, this is only the tip of the iceberg. 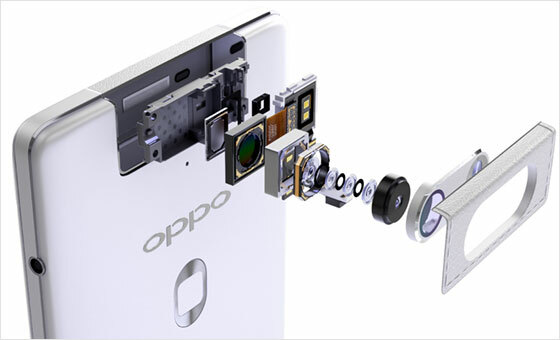 OPPO has developed both a slow rotating and fast rotating mode for the camera. While using the slow rotating mode, the camera is able to slowly swivel in precise increments of 0.012° in either direction with its precision stepper motor. This precise rotation is designed to capture the fine details of the picture within the entire span of 206° in a seamless, smooth and stop-at-will manner. To quickly swivel the camera, simply swipe downwards on the display and the camera will rotate into the front facing position. With a swipe in the opposite direction, the camera will swivel back into its original rear facing position. 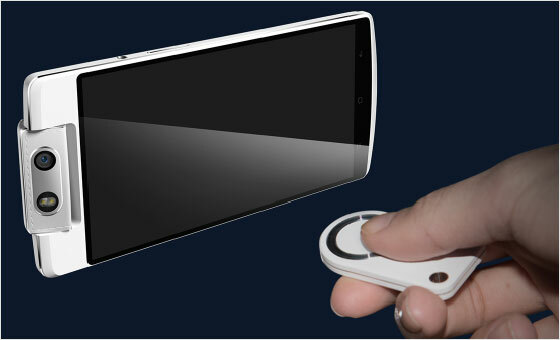 The N3 has multiple ways of rotating: the camera may be controlled using the Touch Access located on the back cover or theO-Click. Fast rotating and slow rotating modes can be activated by all rotating methods so you are able to always get yourself the best angled shot. Coupled with the 16 megapixel camera, you’ll have awesome optics at your disposal. The Touch Access enables single handed photo shooting; while the O-Click can remotely control the camera within 20m. If the phone receives a call when the camera is rotating, just swipe the screen to pick up the call, and the camera will automatically return to its normal position. With this user-friendly feature, you can use the N3 at ease, adding a human touch to the flexible motorized rotating camera. 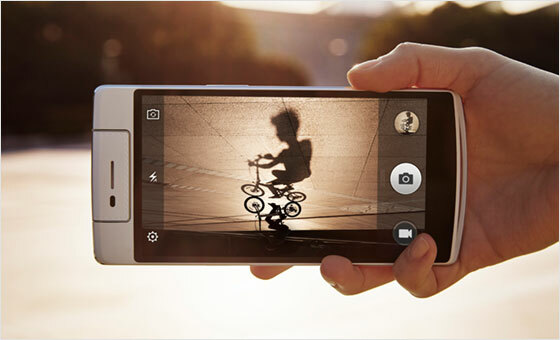 With the motorized rotating camera, unique photos are at your fingertips. Want to take a full-body portrait with the Eiffel Tower beside you? With ordinary phones, there are only two possible options: a half-body portrait or a clipped image of the Eiffel Tower. The N3 gives you a third option–a perfect wide-angle shot, possible thanks to its new Auto Panorama function, which has been developed to capitalize on the power the rotating camera. With the Auto Panorama mode, the camera can rotate on a fixed pivot horizontally or vertically to create a panoramic shot. The rotation speed of 0.012° per second serves to eliminate stutters due to shaking so you are able to have absolute control. Quite obviously, shooting panoramic pictures with the N3 offers more creativity and a broader view compared to shooting with a conventional wide-angle lens. With the OPPO N3, just a single swipe gives you that perfect self-portrait with the Eiffel Tower. Simple and fun, the N3 makes taking panoramic shots of frescos or any magnificent landscape a piece of cake. Blurry photos have you at a wits end? Ordinary smartphone cameras tend to produce blurry images when the target objects are moving due to focus delay. The Tracking Focus feature of the OPPO N3 automatically rotates along its axis to track the target object and adjusts focus to snap a crystal clear image in a heartbeat. With a wide shooting frame and an unparalleled tracking function, the N3 is second to none when it comes to recording the moments that matter most. OPPO designed the N3’s motorized rotating camera with durability in mind so that manual operation does not cause any more wear and tear than normal remote operation of the rotating camera.OPPO conducts strenuous durability tests of 250,000 rotations for the rotor of the N3’s camera and the stepper motor under various temperature and humidity conditions. The rotor itself is further subjected to a test of 100,000 rotations. This means that even if you rotate the N3’s camera 100 times a day, you can do it for 3 years without any issues. The motorized rotating camera of the N3 is equipped with a 16 megapixel Schneider-certified optics lens and is paired with an aesthetic design, representative of German precision style. It is noteworthy that the N3 utilizes a 1/2.3-inch photosensitive element with a pixel size of 1.34μm, exceeding the standard of many flagship Android devices. With the optimum balance between high resolution and photosensitive element size, the N3 creates high quality images that accurately reproduce the scene. 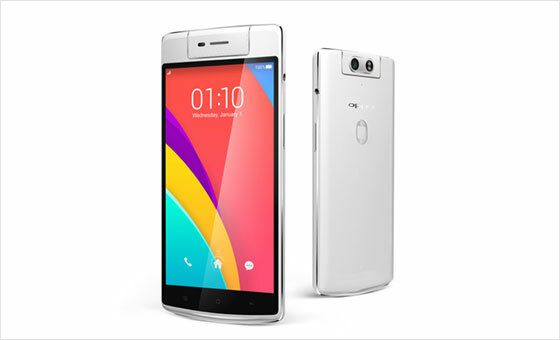 As a camera phone certified by OPPO, the N3 is enhanced with the PureImage 2.0+ photography platform, an integration of flagship image hardware and software operation, providing users with customizable and intelligent photo shooting experience. More and more shutterbugs continue to choosethe N3 for a much more fun and easyroute for taking creative photos. N3, it’s your turn! 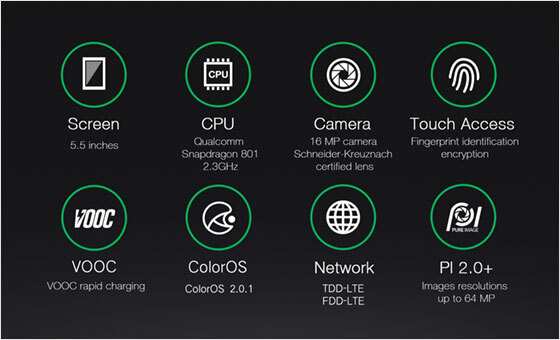 Copyright © 2015 OPPO. Any information contained in this press release may be subject to change without prior notice. For our products and services, the only provisions for guarantee are stated in the warranties that accompany those products and services. Content in this press release do not constitute additional warranties. OPPO shall not be liable for any technical and editorial errors or omissions contained herein.